Desc: 14 karat white and yellow gold diamond horse head necklace. The chain is 14 karat white gold and is a cable link with a lobster claw clasp. The pendant is a slide style and is circular 14 karat white gold. Round brilliant cut diamonds are prong set along the circle. There is approximately 0.75 carat total weight diamonds mounted in the circle. 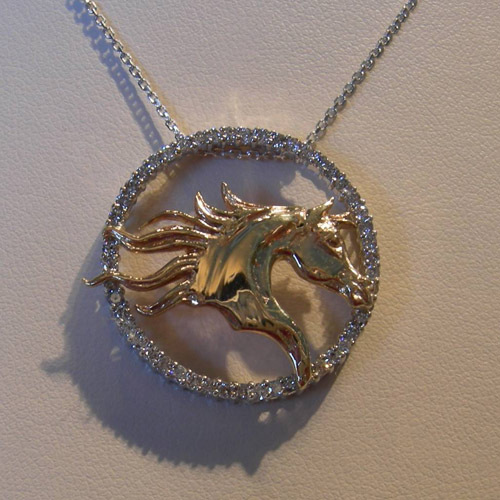 One 14 karat yellow gold Arabian horse head is mounted in the center of the circle. The mane is flowing majestically behind the arched neck of the Arabian horse. This is a custom made necklace and has a bright polish finish.